MOOCs have become such a buzzword today, that a number of initiatives have been taken worldwide to utilize their benefits to the utmost. There are numerous credible websites, universities and institutions which are an abode to MOOCs. What’s required is a comprehensive platform that provides us with ready access to the best MOOCs available out there and makes us utilize them in an efficient, innovative and engaging way. Here’s where SkillAcademy comes into picture. It helps you develop effectively and efficiently with MOOCs offered by the best universities in the world for free. With SkillAcademy, individuals and organizations can plug-n-play a world-class university size e-learning platform with 10,000 courses in less than a minute and for free. They can bundle already existing courses together to develop bootcamps (collection of courses) as a form of training for themselves or their people. Search for courses of interest. Bundle courses together in a bootcamp . Share the bootcamp with the target audience. It is very simple to use and offers free courses from Coursera, edX, Udacity, Venture Lab (Now NovoEd), Codecademy, Canvas Network, and iTunes U by the world’s best universities including Stanford, Harvard, UC Berkeley, MIT, University of Pennsylvania, Georgia Tech and lot more. To use SkillAcademy you can sign-in with your Facebook or LinkedIn accounts and organizations can sign-up through a simple online form. Once you’re logged in, other than searching for content, you can also create your own bootcamps which are a collection of courses you select. Collect particular course to create a comprehensive bootcamp to have everything on the subject together for a better learning experience. Searching for a topic will give you a result of results on it, containing the summary of the lesson and you can also go to the original link of the lesson from here. Search can be filtered by Type (Courses, bootcamps), Subjects (Arts, Business, etc. ), Provider (Coursera, EDX, etc.) and Start Date (Self-paced, In session, etc.). For organizations: With SkillAcademy, organizations will save the time, effort, and money. By unlocking organizations’ access to cutting-edge knowledge by the world’s best universities, it aspires to push companies to acquire desperately needed skills in order to advance their organizations and embark on bigger missions. For online education: Learners typically question the legitimacy of MOOCs to get a new job. So it lets companies try them first for their current employees, and potentially develop bootcamps for new job positions, projects, or promotions. In a way, they are endorsing MOOCs for the workplace. SkillAcademy has also launched a program named, 100Partners, through which it endeavors to proactively reach out to partner with a 100 worldwide organizations that believe in the role of education and power of technology in developing their people and community. What the program does is that, it aggregates 10,000+ free online courses to help organizations setup their online skill academy. Within the academy, they can build skill bootcamps, each composed of already existing free online courses offered by the world’s best universities. Other than the general benefits like slashing e-learning and training costs dramatically, finding cutting-edge education content by top-tier universities and personalizing skill bootcamps for various target audience it offers other benefits as well. Free Access: to the SkillAcademy dashboard to boost your teams’ skills. Engagement: in product development to communicate your additional needs. Early Access: with great discounts to future value-add paid services (if any). 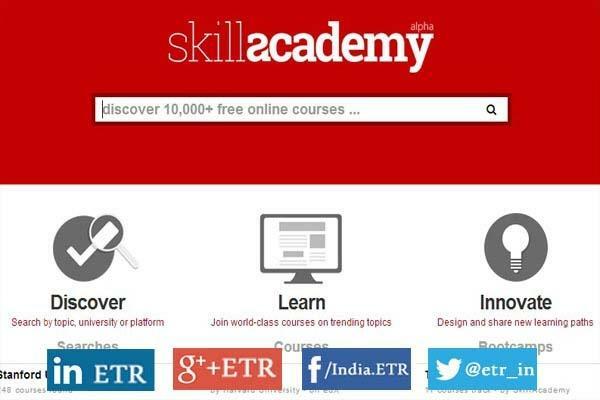 SkillAcademy is a comprehensive website to learn from quality MOOCs available online. The sources it derives content from, are credible and reliable and are among the most popular MOOCs offering sites. With SkillAcademy, you can take free courses of subjects such as Arts, Business, Education, Computer Science, Engineering, Humanities, Law, Language, Mathematics, Medicine, Science, Social Science, Statistics and Data Analysis provided by sites such as, Coursera, EDX, Udacity, Code Academy, Venture- Lab and Canvas Network. You can select the courses you take to be Self-Paced, In session, Within a month, In the future or To be announced. More courses as well as bootcamps (collection of courses) are available from renowned universities around the world. I’d infer that SkillAcademy can be used to completely train yourself in any of the courses or subjects you like and it offers. It has a simple user interface and guarantees quality content from reliable sources and universities. Apart from just offering MOOCs collectively, it encourages you to use them in such a way that they are most effective, especially with its fascinating feature that helps create bootcamps. It is really an academy for skill development and enhancement. Give it a try now to avail of its services. You’re invited to share your views, knowledge or clarify doubts on the context. The comment box awaits you.